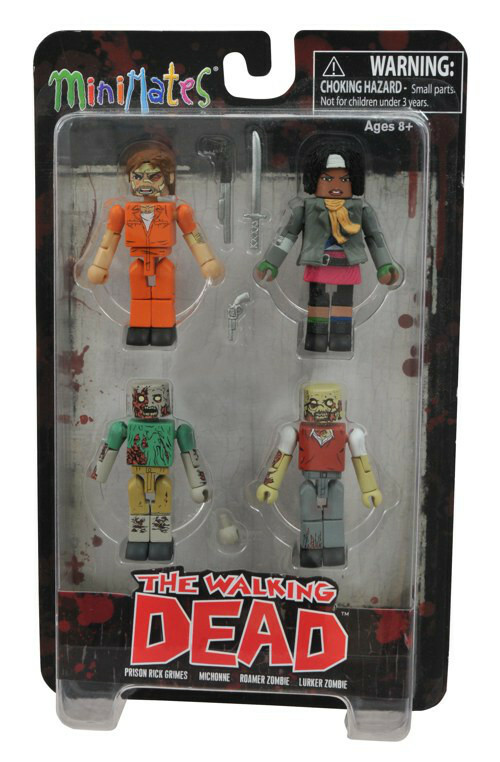 December 2012 - The first series of Walking Dead Minimates has been selling out in stores on both sides of the Atlantic, leading to a worldwide zombie shortage! In order to alleviate this shortage, Diamond Select Toys and Amazon.com have teamed up to offer an exclusive four-pack of Minimates, taken straight from the hit comic book series by Robert Kirkman. The set includes two new zombies, a Roamer and a Lurker, plus all-new versions of Michonne (with angry expression) and Rick Grimes (in prison garb, with battle damage). Each Minimate stands 2 inches tall with 14 points of articulation, and features interchangeable and removable parts. The set also includes Rick's shotgun and pistol and Michonne's sword, and will be available on http://Amazon.com in mid-December.